The heatwave in London continues without any sign of abating. The grass and flowers outside my window are looking parched and so is my skin. The most important solution to keeping your skin plump and hydrated is to drink plenty of water. I keep a bottle by my side at all times. I find it difficult to drink large quantities of water at any one time so I prefer to take regular small sips. The bonus of summer is that we tend to eat lots of salads and raw vegetables which also helps to keep our reservoirs of water topped up. I also like to keep my skincare regime simple and quick. I don’t believe in overloading the skin with too many products. At the moment I am giving my face a quick wipe with Bioderma Miscellaire Water. I then add a small amount of light moisturiser. I have been trialling a new skincare brand for the last few months. 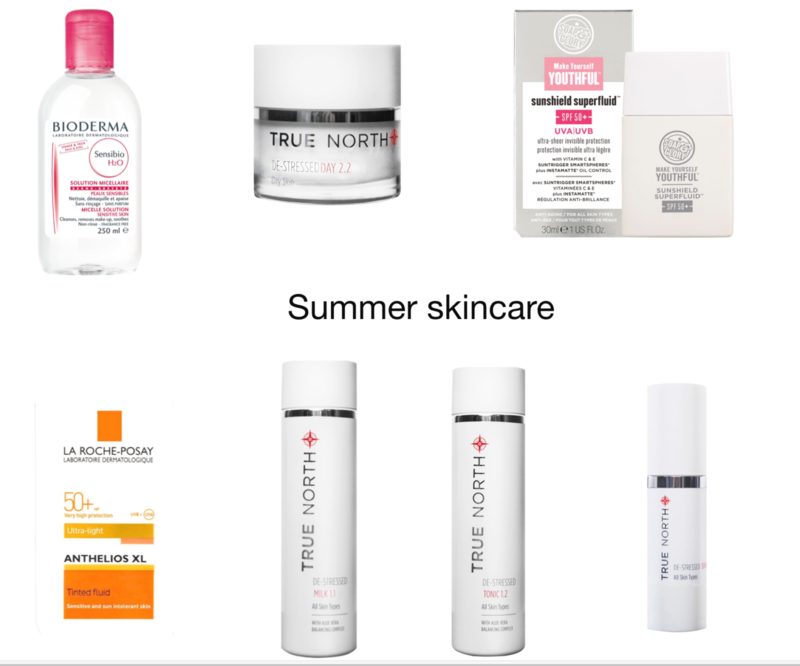 I really like their True North De-stressed day cream. It is light and sinks in quickly. Personally, I don’t like a very heavy cream as I find it can clog my pores. I allow the moisturiser to sink in before adding an SPF sunscreen. I currently like Soap & Glory Sunshield. It is mineral based and apparently, it also protects the skin from the blue light emitted by computers. If I am working from home and not going out, except for a brief trip to the local shops, I relace my sunscreen with La-Roche-Posay tinted cream SPF50 this does two jobs in one. I am currently using the True North de-stressed cleansing milk followed by True North de-stressed tonic. I like to massage the cleansing milk in with my Foreo (US link). I find that it assists in getting all the makeup and daily grime out of my pores. I also feel the massage action helps to increase the blood flow and stimulate the circulation. Finally, I add a fine layer of True North serum. Disclaimer: The NorthFace products were gifted. Are you wearing the correct makeup colours?